Need a quote? Get started with our custom tag quoter. We guarantee the best prices online and won't charge extra for artwork. • Create your custom tags from our broad range of sizes and materials. Order a minimum of 1,000 custom cardstock tags. • Our plastic material has a minimum of only 10 tags. When you need a few custom tags, our plastic materials offer the most affordable option. • To compare prices for different materials, use our quoter on the right. 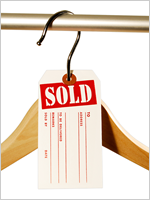 Compare prices for a range of cardstock tags. Get an online, no-obligation quote today. • This is the classic – and remains our perennial top seller. • It’s strong, easy to write on – and affordable. • Instantly price out attachment options - including wires, stringing and different eyelets. Tags may be numbered and a perforated tear-off stub may be requested as well. • Choose from 12 different colors. It’s easy to color code. • The tag can be printed on either (or both) sides. • Quick options include stringing, wires, numbering, perforations, and more. • No tag gets seen faster! Make sure that your tag is not ignored. • Choose from four “hot fluorescent” colors. • Quick check off your eyelet, size, numbering, perforation and wiring options. • Eco-friendly tags made from 100% recycled cardboard. • Brown kraft paper gives your company an environmentally conscious look while staying trendy. • Choose from a range of tag options including attachments, numbering, and different ink colors. • Order with one or more paper tear-off copies. Each paper copy is glued onto the base tag material. Below each paper layer is a NCR layer. This allows your writing to transfer to each layer of the tag, including the base tag material. • Tags can be sequentially numbered with the number being stamped onto all layers within the tag. • Create a tag with a handy tear-off stub. • Each tag (and accompanying stub) can be uniquely numbered. This makes it easy to track batches, repairs, inventory, etc. • Order perforated tags in 7 different sizes and over 18 different colors. • Customers love our tags for a durable and distinctive merchandise tagging. • Print on one or two sides. • Metal rim tags provide the appealing pricing of a cardstock tag along with the durability of a metal tag. • Customize these merchandise tags to add a professional touch to your products and store. • Available in 10 colors - match your decor or color code your inventory. • Print your logo, along with your pricing info, to enhance your company brand! 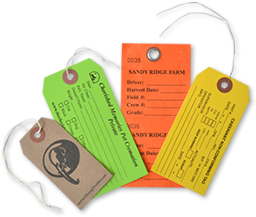 Order as few as 10 custom tags in our plastic and self-laminating tag materials. • Choose from three different plastic tag materials and four different sizes. Both eyelet and grommet options are available. • All plastic tags can be printed on both sides – and in full color – at no extra charge. • Order as few as 10 custom tags. 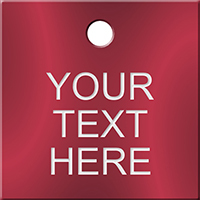 • Get a quote on our most durable custom tag material. These tags are field –writable. Once your writing is complete, seal it all in with the tag’s self-laminating flap. • Tags are printed digitally. That means that you can print your tags in full color (and on both sides) for no extra cost. 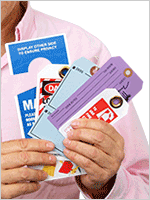 • Flexible and tear-proof, custom Tyvek tags have a loyal following. The minimum order is 1,000 custom tags. • Choose from ten different sizes and various attachment and eyelet options.